"Juan Diego Flórez is THE tenor for bel canto operas, the first choice for any new production at the world's greatest opera houses. Flórez recently performed the first aria encore at La Scala in 74 years. On 'Voce d'Italia', he pays tribute to an extraordinary predecessor who inspired some of his greatest stage roles and became the first 'superstar tenor': Giovanni Battista Rubini. 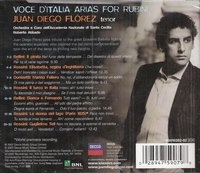 Many of the arias by Rossini, Bellini and Donizetti on this new recording with the Orchestra of the Academy of Santa Cecilia, Rome under Roberto Abbado, are unknown gems which show the tremendous range of Flórez' vocal and dramatic art. Flórez thrillingly tosses off those high Cs which have brought him so much fame, and ventures further into the stratosphere with a few high Ds and his first high E-flat on record."